I found this quaint gentleman yesterday. 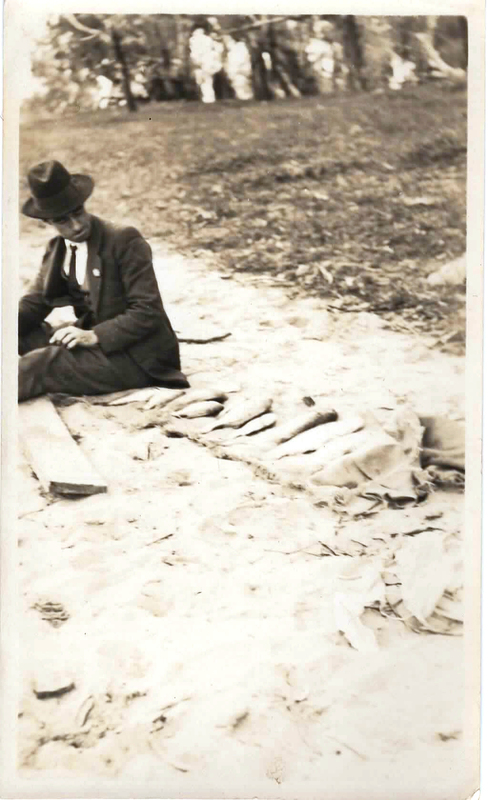 It was hard to make out first, but I realized that they were fish lined up next to him (a little harder again to see in the scan, but they are there). I think I was drawn in by the expression on his face. You can almost see him turn around and nod with satisfaction. He seems so well-dressed for a spot of fishing too. I feel like there is a story somewhere behind this picture. I like to wonder who it would have been who took the picture too. It doesn’t seem that old, so probably just a lovely little Kodak moment by the river. A family member or a friend perhaps. I would love to know if anyone could hazard a guess at the era of this photograph. I am not much of a good judge on clothes. I find these candid moments captured in photos much more interesting than stiff portraits. I feel like there is real life and character in there. It was well worth the $1.50 I paid for it! The photo has been enhanced a little in Photoshop, but unfortunately some details were too overexposed to bring out. It looks much crisper in person. You can actually make out some of the details in the fish, and the expression on the man’s face is a bit clearer.